'COUNTDOWN' GAME: You choose the cards - "A vowel please, a consonant, another vowel". The timer is turned and you've got thirty seconds to find the longest word from the cards. The countdown has started, time is running out and you can feel the tension building! Round two and you've got thirty seconds to match the number of the number randomiser. Finally round three and thirty seconds more to solve the 'Conundrum'. 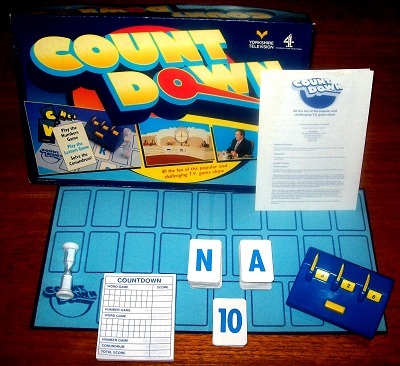 This game contains everything you need to play the exciting game of Countdown. This game is complete and has barely been used, if used at all. Apart from the most minor storage wear to the box, it is in immaculate condition. Every card is in excellent condition; the playing surface is flawless; the timer and number randomiser are in full working order and in perfect condition; and there is a large, if not full, compliment of scoring sheets included.